We offer two options for book purchase. (2) Select PAY WITH CARD. (2) Select PAY WITH PAYPAL. 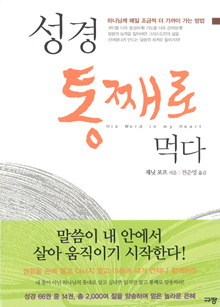 My new book His Word in My Heart is a revision of my 2002 book with the same title. So why did I rewrite the book? Expand the audience – My first book was written primarily for stay-home moms. 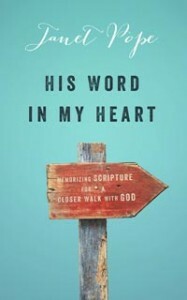 The new book includes working women, men, and anyone who wants to memorize God’s Word. Bring Scripture Memory techniques into the 21st century – My 1st book recommends writing out the Scripture passages on spiral-bound index cards. Today we’ve got more options with the Bible on our phones, iPads, and tablets. Revise the original chapters & add new ones – Each chapter has been rewritten to include many things I’ve learned over the years. I also added new chapters on: review, small groups, transformed thinking, and your fork in the road. The Christian life is an odyssey —an unpredictable, arduous journey with many bends in the road and surprise encounters along the way. As travelers in a strange place we have no control over the elements: the cold, the wind, the darkness. Uncertainty pervades, hardships abound, and obstacles lurk in the shadows. The struggles we each face will vary, but we share a common destination. When our Father calls us home, He guarantees our arrival. The issue is not where we are going, but how we will get there. Twenty years ago, at a fork in the road, my life took the path that led me where I am today. The forthcoming details share the essence of my story. Inspired by an unknown woman, I began to memorize long passages and entire books of the Bible. Two small children and a never-ending list of things to do left no extra time slots in my day. I reasoned that if God wanted me to know Him and His word, He would make a way. He wouldn’t require something of me and then make it impossible to achieve. I trained myself to use moments throughout my day to memorize Scripture when my hands were busy but my mind was free. Household chores required busyness but not thoughtfulness, so I included Scripture memory in my daily routines: showering, drying my hair, folding laundry, vacuuming, waiting in traffic or at the dentist’s office. Idle minutes became opportunities to get to know God’s Word. Over the years, this practice has added up to an enormous amount of Scripture memory, 140 chapters so far. However, it’s not the accomplishment that has changed my life but rather the process of thinking and meditating on specific truth learned in its context. I saw a major difference between memorizing scattered verses and memorizing verses that follow each other sequentially. I learned whole truth, not fragments, fit together the way God had intended. I experienced new depth in my relationship with God as I got to know His Word one verse at a time. My initial motivation was strictly personal; I wanted to get closer to God for my own well-being. But I also knew how much influence a mother has on her children. Without wisdom from God, where would I lead them? God’s Word, continually on my heart and mind, brought insight and discernment to each new situation. As a mother, I wanted to teach my children the way in which they should go, and now that role was less arbitrary. Scripture memory became my platform as people called, asking me to share my story with the women of their church. Why? Because they too were desperate to have God’s Word as a constant source of nourishment for their weary souls. As I travel and speak across the country, I’ve found that women don’t want to postpone a closer walk with God until they have more time. Women hungry for God need Him today. In this book I present an alternative for the frazzled, guilt-ridden woman who longs to know God and His Word but hasn’t yet found a way to accomplish this amidst the unrelenting treadmill of activities. I cannot add one more hour to your day, but I can help you change the minutes and the moments you already have. My desire is to be intensely practical. Take my experience and my suggestions, and adapt them to your own situation; find what works for you. I hope to lead you to the oasis of God’s Word, to inspire you to trade your thoughts for God’s. As you give your attention to His Word, He will meet you in unexpected places—amidst the laundry pile and the dish pile, in the carpool line and the drive-through line. Your relationship with God will grow deeper and richer than you ever imagined. As your constant companion he’ll become an intimate confidant. On our pilgrimage through this life unforeseen hurdles await us, but the road was never meant to be traveled alone. God gave us His Word to guide us through the lonely valleys and immovable mountains we face. For me, the journey takes on new meaning. Though night approaches, I move forward unafraid. An illuminated path shows me the way, one step at a time, with His Word in my heart.